A few days ago, I was battling a really bad migraine headache. You know the kind. My eyes couldn't stand light, my ears couldn't stand loud noises, my body was ruled by the pain in that one place, my head. Darkness was my friend. I really struggle with slowing down. So I put on essential oils and rested. The struggle eased up enough later on that I decided to take Miss E to the park to run out her energy. She had been running all over the house because Mommy couldn't teach school for her and wasn't able to keep up with her massive amount of creativity. Luckily Daddy was home for a bit and stepped in to teach some school and keep up with her! It was a cold, brisk, winter day. With it being overcast, I could handle this adventure for a little bit. As we got to the park, I knew in my mind that the chances of there being others at the park were slim. Most people were in the warmth of their homes or offices. So when we got to the park, we donned our jackets and headed across the grass to the playground. This playground has been the host to many play dates for our girls. Big Sis and Little Sis have run, climbed, screamed and laughed for hours here. But today, we were alone, the 2 of us. I was feeling sad about that as I sat down. Miss E asked me to play with her. I responded that I couldn't but to run and play so that she could get her wiggles out. She is getting used to entertaining herself in moments like these. So she did just that. Our little bundle of courage jumped in puddles, climbed, laughed and hollered for me to watch everything! I gladly participated in watching her explore. At one point I looked down at my phone as a message popped up. Then I heard Miss E from across the playground by the swings yell, "What Mommy?!" And again rapid fire, "What Mommy?" (because you know that we hardly ever answer fast enough anyways). I looked up smiling at her and said, "I didn't say anything." Then I paused and followed up, "What did you hear?" Miss E cheerfully shouted as she ran towards me or the sea saw, "I heard my name!" She didn't think anything of it but that moment wasn't lost on me. In the moment that I felt less than enough for our little girl, her sister showed up to play. Tears welled up in my eyes and if they fell, I couldn't feel them because of my cold face. But I wiped my cheeks and said a little prayer of gratitude for this moment of miracles for Miss E and her Mommy. I have noticed in these moments how light and free Miss E seems to feel. She looks joyfilled. Giggling comes easy to her. Her creativity is heightened and she acts like she can accomplish anything good. As she was playing she gathered up some things of nature-sticks, a pine cone, a leaf, all carefully chosen. 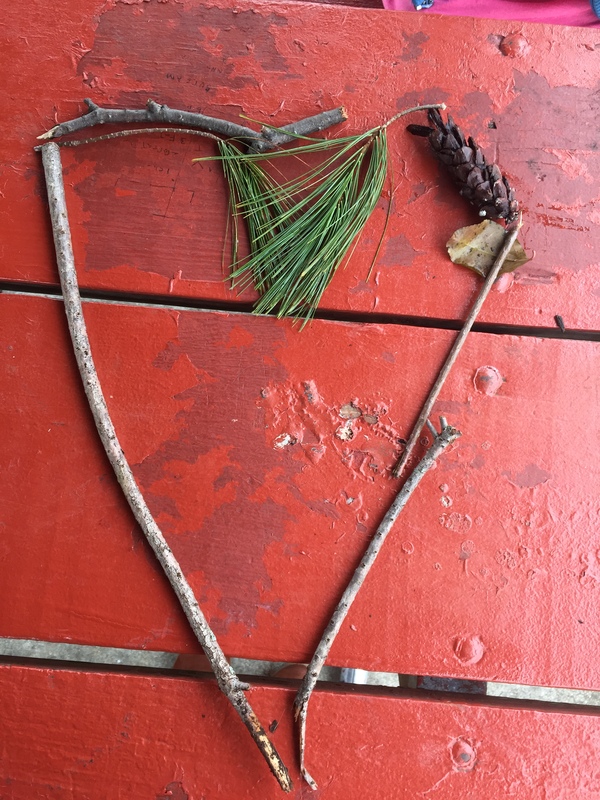 As she placed these treasures gathered by her little 5 year old hands, she and I moved them into the shape of a heart and smiled at our impromptu art-something her big brothers and sisters have done with their Mommy in the years before. In all good things there is love sustaining it. For this bright moment in a darker time, I am so grateful. Affirmation: I am joy filled. I am present for each miracle. I am open to feeling the wonder around me. I am supported. I am blessed. If you are not already a discount member of doTERRA, we would love your support with your purchase from us. We are dedicated to healing hearts and lifting individuals and families. Your purchase will help us accomplish our mission. Thank you! The Forgotten Victims of Modern-Day Slavery?